Stunningly beautiful, multilingual, Dominican Republic-born actress Katherine Castro is making waves with her diverse background, talent, and passion for her career. 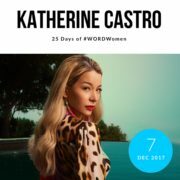 After her feature on NBC Latino’s Top 10 Standout Latinos at Sundance, Castro received the Hollywood FAME award for ‘International Breakthrough Artist of the Year’ and an award from the Women in Film Association in the Dominican Republic. Castro‘s empowering journey from TV host and actress to producer has made her Hollywood’s next most lovable Latina.